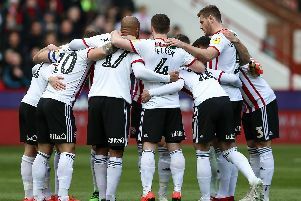 When Nigel Adkins was revealed as manager of Sheffield United, one former player’s name immediately sprung to the forefront of Blades fans’ thoughts. Billy Sharp - boyhood Blade, somewhat disappionting while a player with the club he loves, but hugely successful under one manager in particular...Nigel Adkins. Adkins has taken Sharp everywhere with him and more often than not, the Sheffield-born 29 year old has repaid the faith shown in him, in goals. And a striker is thought to be high on the list of transfer priorities for the new man in charge at United. Inevitably, tongues began to wag about the possibility of a return to Bramall Lane. Adkins, of course, played down speculation, with Sharp contracted to Leeds United. Chris Morgan, the Blades under 21 coach, however, is a man who knows Sharp as a player and a friend. He insists there has been no official talk about the chance that Sheffield United might make a move for the striker, but Morgan does know that Sharp, who began his career as a trainee at United and was bought back from Scunthorpe for a fee of around £2m, feels he has unfinished business at the club he loves. “I think it’s an obvious one (to be speculated on),” admits Morgan. “The gaffer’s had him at Scunthorpe, he’s had him at Southampton. “I think Sharpie has made no secret that he’d love another shot at coming and playing for the club. “If you were to ask Billy when was the best spell he had as a player it has been under Nigel. Morgan believes that the expectation levels that Sharp, as a Sheffield-lad probably placed on himself, may have had a detrimental impact on his performances in this particular red and white shirt. Perhaps an older, wiser Sharp wouldn’t have the same issue. “You put (pressure) on yourself,” said Morgan. “He is a supporter, he has stood on the terraces and then all of a sudden it’s your club and you want to be the main man, you want to play well. “Certainly there’ll be no more pressures put on a young man who’s a Sheffield United fan coming through or at any club. “There’s no pressure internally put on them; that youre a supporter, you must do this, you must do that. -Chris Morgan’s Testimonial game against Newcastle United will take place at Bramall Lane on July 26. Three charities will be supported by the game; Weston Park Cancer Charity, Bluebell Wood Childrens Hospice and the Gary Speed Trust.